Recently I had the honor to present my art and the meaning behind my thought process at Slide Slam. This event was sponsored by the Patchogue Arts Council and hosted by the Haven Gallery in Northport NY. The presentation by the 20 selected Long Island artists was to display a slideshow of 15 images and speak for exactly 5 minutes each about the work. Such a daunting task proved to be an interesting challenge. How do you get to the essence of your work succinctly in such a short span of time? After the event, I created a video of my Slide Slam talk which you can see here. Important for me was to convey how critical the garden is to my work. It is in fact the beginning of my creative workflow. In the garden I feel the power of the interconnectedness of all that surrounds me; the necessary ecological balance of the earth, climate, water and nutrients, that sustain the cycle of life. The communities of birds, bees, insects and yes, humans to pollinate flowers with the assistance of the wind of course. This cooperation is the main critical component of maintaining not just my garden but our entire life here on earth as we know it. Without fertilization the cycle of life would die for all living things, not just for the loss of our beautiful garden flowers but for all our food sources as well. To me, the garden is just a microcosm of the universe. 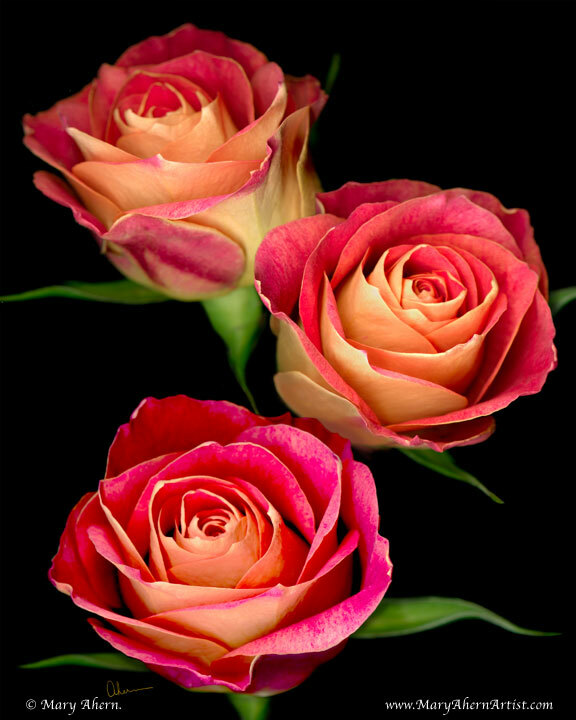 The vast beauty of color, fragrance and the architecture of each plant is created to seduce assistance in procreation. Each flower has evolved its own method for attracting exactly the pollinator they desire. Long tubes for hummingbirds, open centers for nice fat bumble bees. Certain colors are more visible to different insects than others. Fragrance signals an invitation to specific species that the time is right for fertilization. The Brugmansia is most fragrant in the late afternoon since it would rather have an energetic pollinator just arriving on their evening shift than a tired one at the end of it’s working day. Working in and studying my own garden for the last 30 years has given me the unique opportunity to watch dynamic change occur. 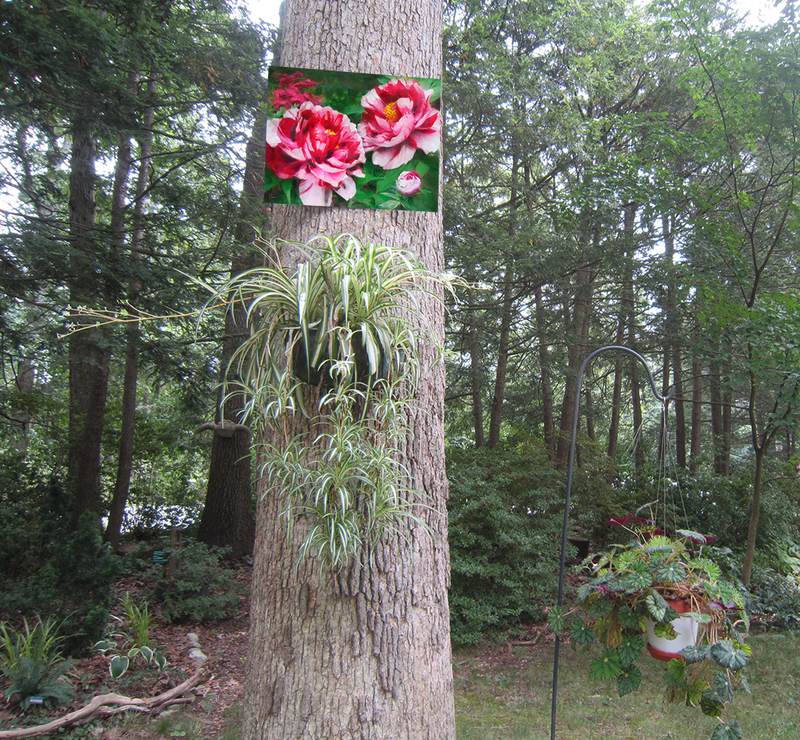 When my oak trees fell in Hurricane Sandy suddenly the types of plants that enjoyed their shade began to suffer from too much sun. I dug them up and moved them and their scorched leaves to where they would be more comfortable and replaced them with flowers that thrive in the drenching sun. Over time this would have happened naturally but I was able to speed up the process. Each day in my garden I’m inspired by the energy of life. I carry this with me right into my studio where I allow that energy to inform my art. Tired of the browns and grays and whites of winter? So am I! I’m looking to get a jump on some brilliant color outside. 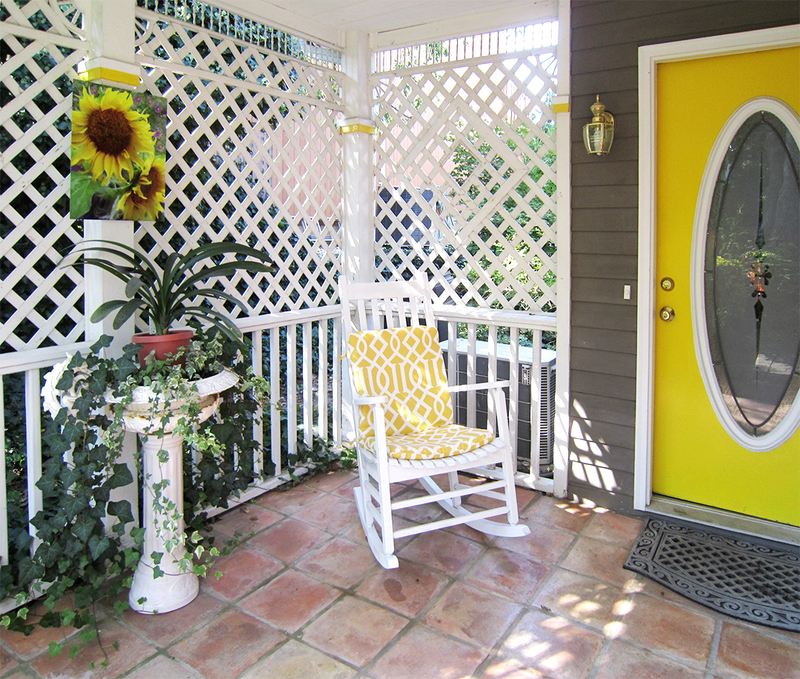 I want to see color outside my windows, outside in my garden and outside on my deck. I’ll bet you are too. 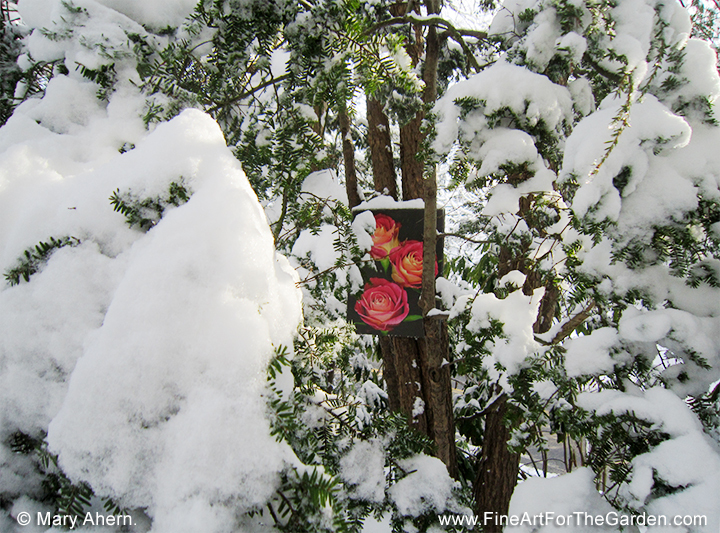 Bright splashes of color greet me when the trees are bare and the shrubs covered with white snow. It is so cheery to see in the dead of winter. Seeing color reduces my stress. It probably does for you too. That’s why gardens are so relaxing. 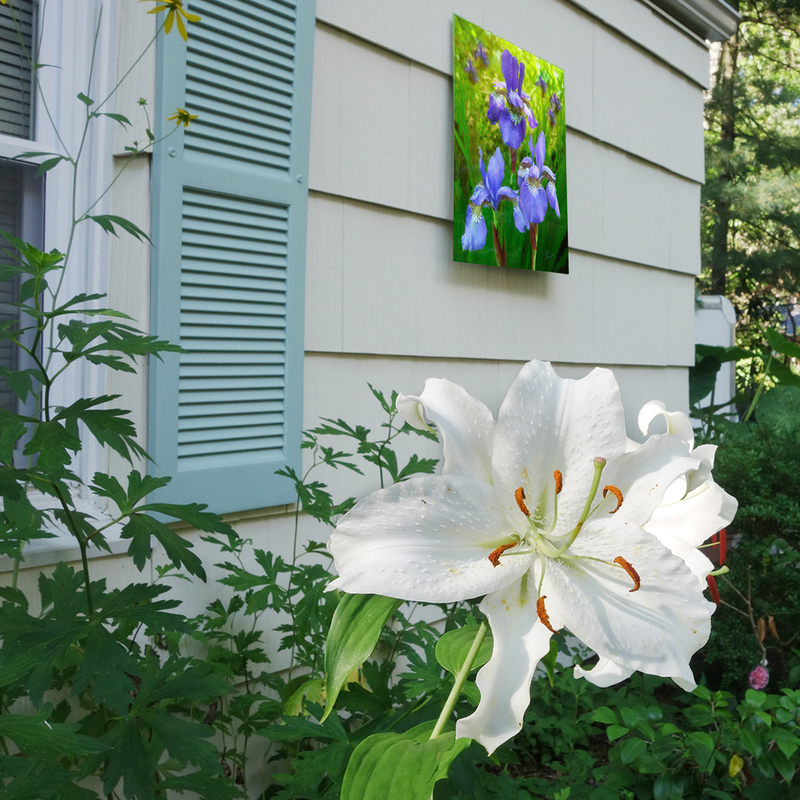 ChromaLuxe exterior aluminum prints hang outside in my garden all year long popping color when I most need it. 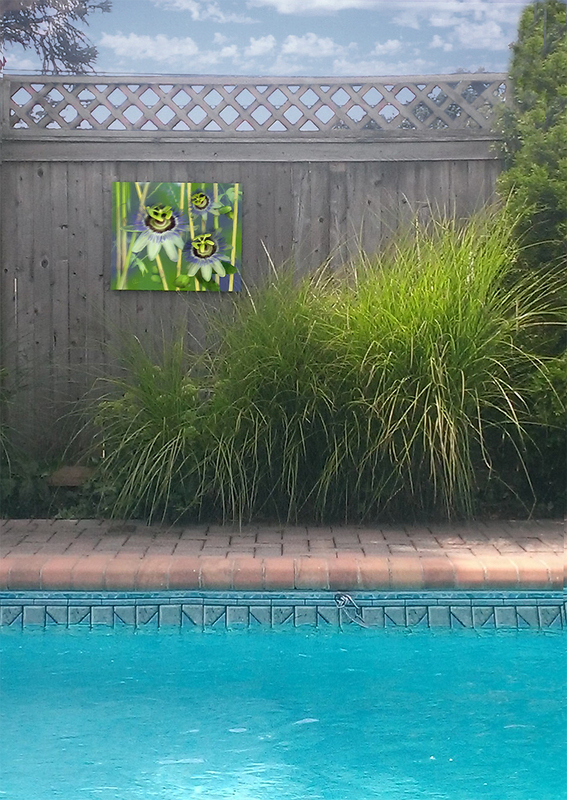 During the spring and summer I coordinate the color of my plantings with the colors in my art. It gives me a very creative palette of colors to work with. It adds to the fun of gardening. 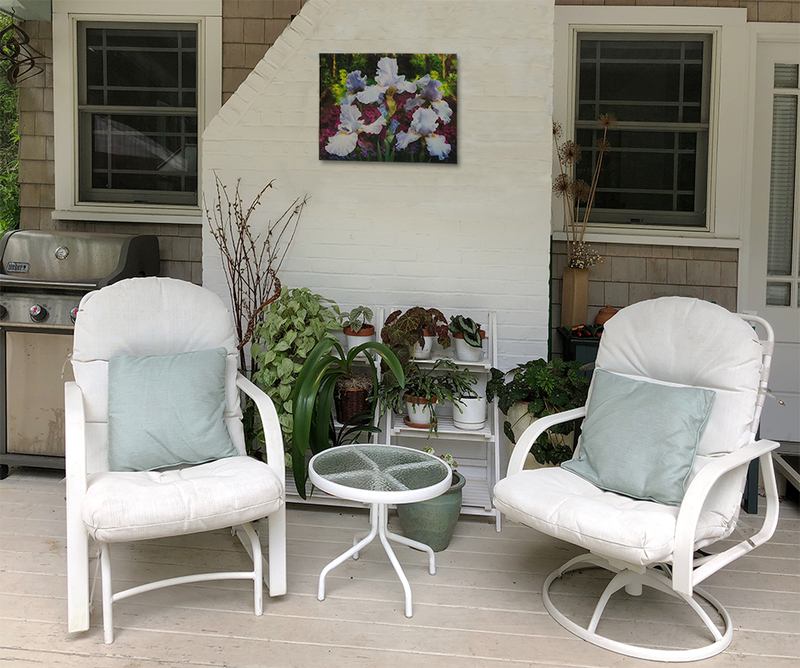 I hang my aluminum art on the garage so I can see flowers all year from the windows in my home, I hang the art on my deck where we entertain and select art that color coordinates with my outdoor furniture. As a garden designer I’ve designed woodland walks around my home and studio and even hang art on the trees for when people wander around on my garden tours. 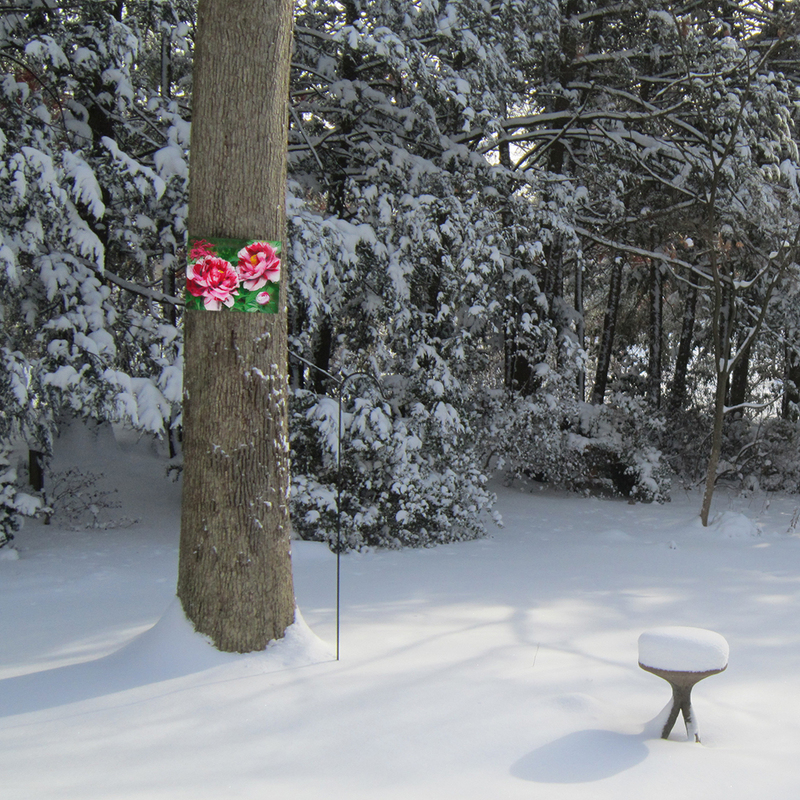 I tried a lot of products outdoors in my own garden on Long Island in New York where we get snow and ice in the winter and lots of heat in the summer. I found that not all aluminum is created equal since much of it warped in the extreme temperatures. Then I tried the ChromaLuxe brand of exterior grade aluminum. 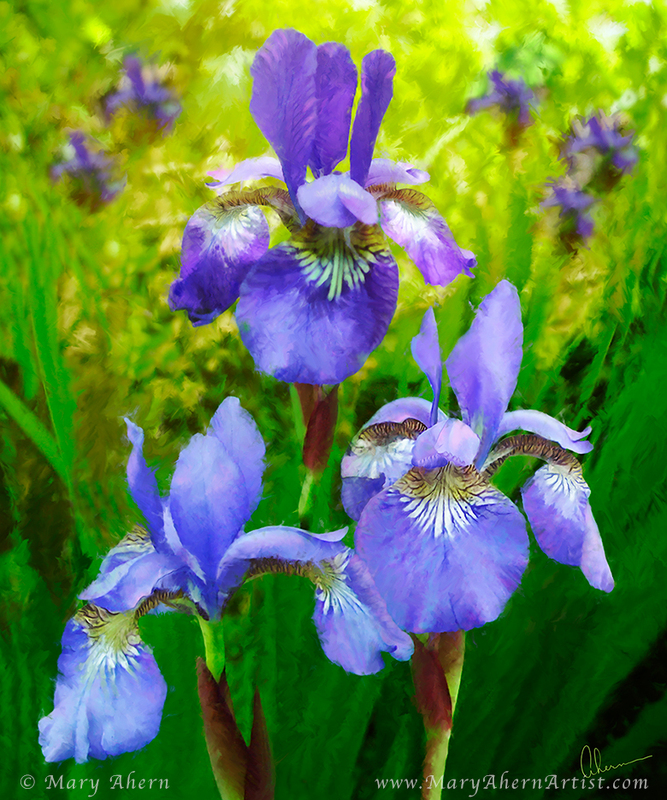 I’ve tested these prints throughout all the seasons and they have flourished in my garden for years. In my video you can see some of the ways I’ve displayed my art in the garden and also the gardens of some of my happy customers. Take a look and be inspired. Then have some fun. On my website I’ve introduced a separate category for the indoor/outdoor metal aluminum art with an augmented reality feature. Now you walk around your space with your mobile device and see how my art will look in your own setting. You can also try different sizes to see what will fit perfectly for you. Seeing this live takes the stress out of deciding what art works for you. It is the ultimate in customizing your own living spaces both indoor or out. Try it now. No commitment to purchase is needed to see for yourself. Go to my online shop, click on the metal print category, select an image that intrigues you, change the size, try a different print, try a different space. Enjoy yourself now! Don’t forget to contact me with your questions! I’d love to hear from you! This was the display of my Aluminum Prints at my show at the Bayard Cutting Arboretum. You can purchase these for your own home and garden here. 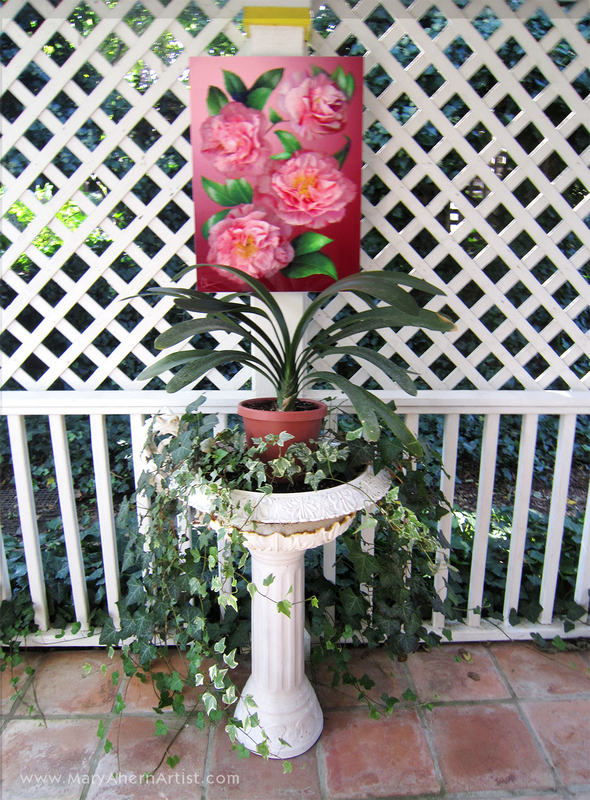 I have always dreamed about having my Art displayed outside around my garden and outdoor living spaces. And now the technology has caught up with my dream. 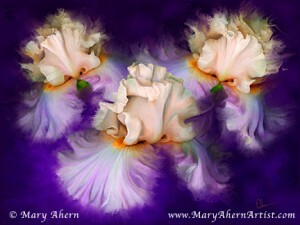 I have my original paintings printed under heat & pressure to create these very vibrant aluminum prints. They can have a glossy or matte finish to them and I haven’t any particular preference since I like them all. Sunflowers and Purple Asters aluminum print at the entrance to the home of one of my collectors. 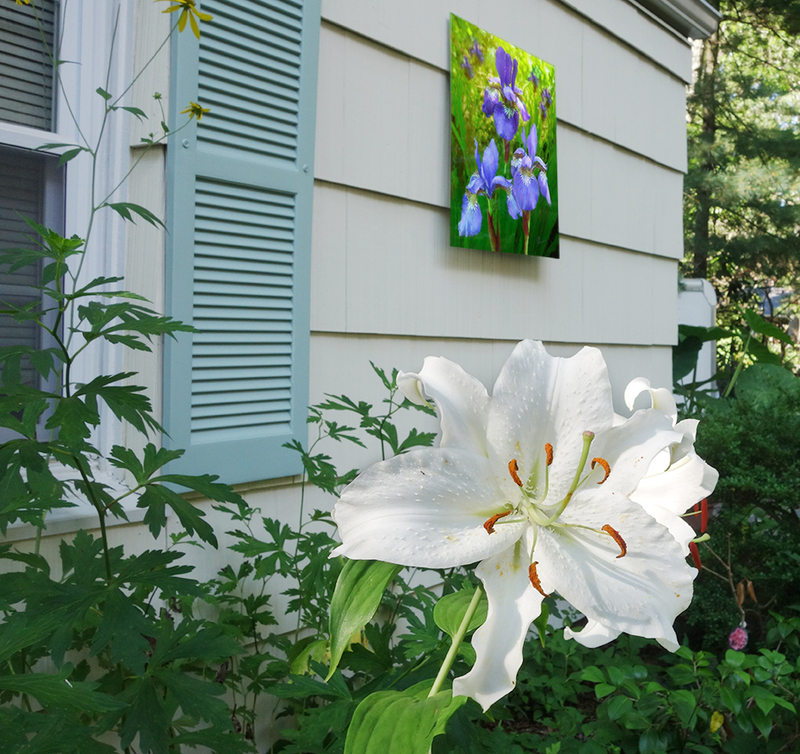 The weather-resistant aluminum which I’ve selected for my Art is thick and durable enough to survive and flourish in my garden throughout the 4 seasons and has been doing so since 2014. Because I wanted to make sure that the quality was right and the color lasted I tested many fabricators before offering the metal prints to my collectors. Sometimes I frame the pieces in simple aluminum frames but most often I just hang them outside, on the trees, on the fences and on the walls. What a delight to look out of my office and look at art instead of looking at my garage & thinking it needs powerwashing! Even better is looking out in a snow storm and seeing the brilliant color of summer flowers breaking through the white and gray backdrop. When the birds decide to decorate the art, I just squirt the pieces with some window cleaner and using a paper towel I wipe them clean again. No problem. The aluminum makes the colors pop whether they’re on a matte or glossy finish. Though these prints can be hung outdoors many of my collectors buy them for inside their homes. Either way, it’s a unique decor addition whether inside or out. 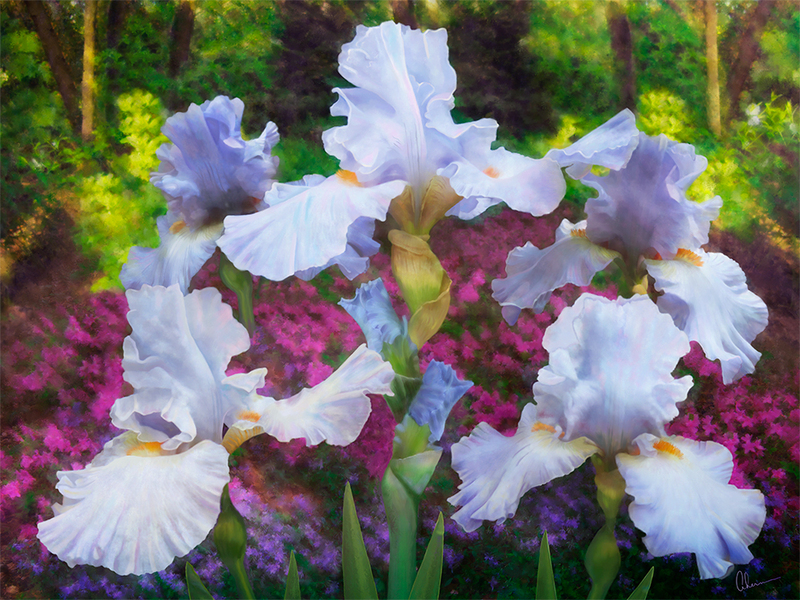 Go now to my website to see how these aluminum prints will look like in your own home and garden using the augmented reality feature on my website shop. Not until I studied botany and viewed flower structures under magnifying glasses and microscopes did I really appreciate their magnificence. As a life-long gardener I looked at and created landscapes, matching groups of plants to be seen from a distance, blending distant views of overall colors and shapes. Matching seasons and cultivation needs, heights and spreads contributing to the designs I created in gardens and on canvas in my landscape paintings. A rainbow of colors in a friend’s May garden. Photo by Mary Ahern. But that aha moment of peering dramatically close to the parts of a flower opened a whole new world of vision and contemplation for me. By painting my flowers overly large and entirely out of scale from the real world, I try to bring that same sense of awe to my viewers. Show them something of what I see. I try to create for them their own aha moment of joy and wonder to take on their journey. Yellow Tulip Squared. Various size prints available on canvas, fine art paper, metal and acrylic in my online shop. 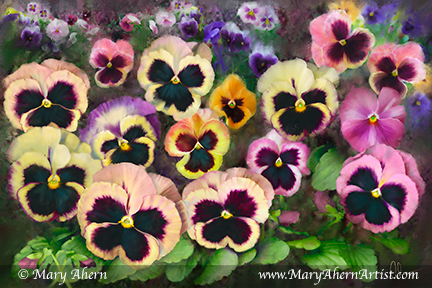 Mary Ahern brought her award-winning style of floral and garden inspired art to the Bayard Cutting Arboretum from May 17 through June 17, 2018. Three galleries of her floral portraits were on display at the historic Manor House at the Bayard Cutting Arboretum in Great River NY. 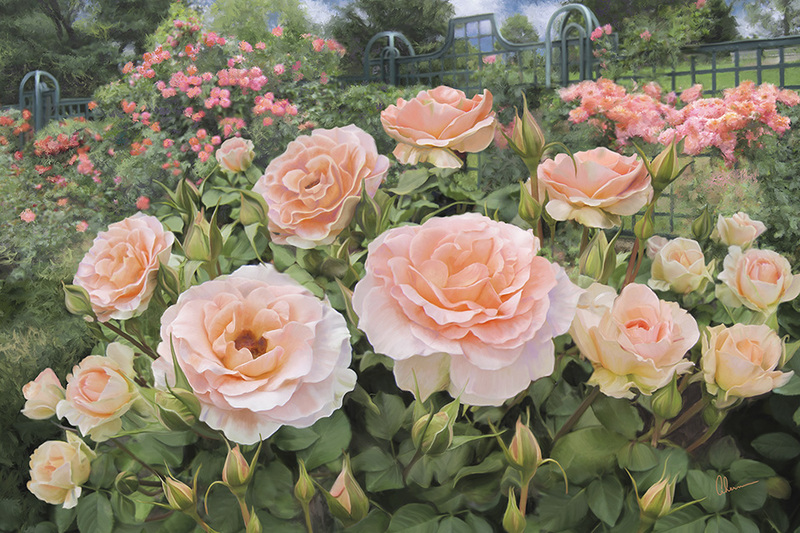 Mary Ahern, known for her brilliant floral and garden paintings was showing her latest large-scale flower portraits. 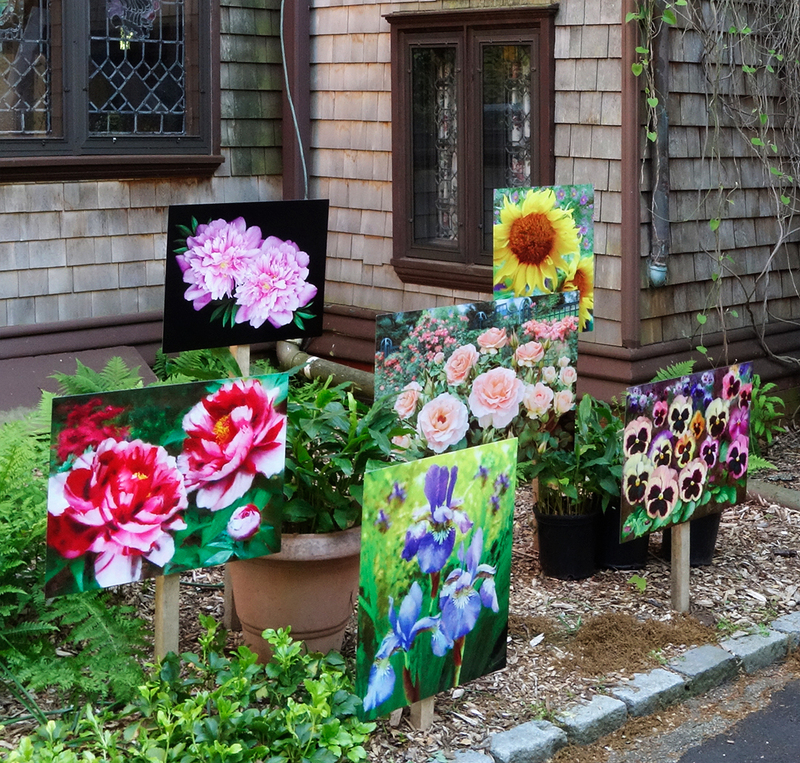 As a passionate gardener who is inspired by the gardens she designed and tends surrounding her own studio, these flowers represent to her a microcosm of the universe. The large scale of these individual portraits asks questions beyond the canvas. Ever wonder what size Art will work in your ideal location? Will the colors of the Art complement your display area? What treatment do I want for my Art? Canvas that is gallery wrapped or framed? Fine Art Paper with matting and framing? Art on metal or acrylic for a new and contemporary look? You can test all of these options in my online Art Shop. Say you found a piece of Art that you’d like to buy but don’t know what size or whether it will work colorwise in your location. White Peony Squared. Prints available in a variety of sizes on canvas, fine art paper, metal or acrylic. My Art Shop is filled with features which will help you to imagine exactly how your new Art will look in your own space. The ultimate in customizing! See what your painting will look like on the wall in a variety of room settings. View the size and match your own wall color. Select the medium of your choice: Canvas, Fine Art Paper, Acrylic or Metal. Next, you select the size of your Art. Based on the medium you’ve chosen you will be able to choose options such as framing or matting. Now you can either add your Art to the Shopping Cart or save it to your Favorites right there in the Shop. 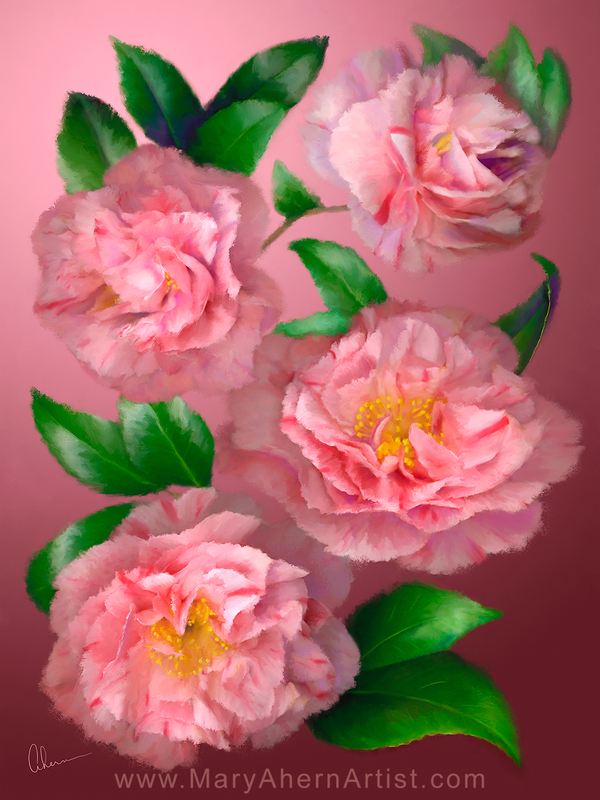 Examine the texture and details of a painting using the ZOOM tool. Your purchase is a safe and secure checkout using PayPal or your credit card. Who has time to waste trying to figure out new menus? 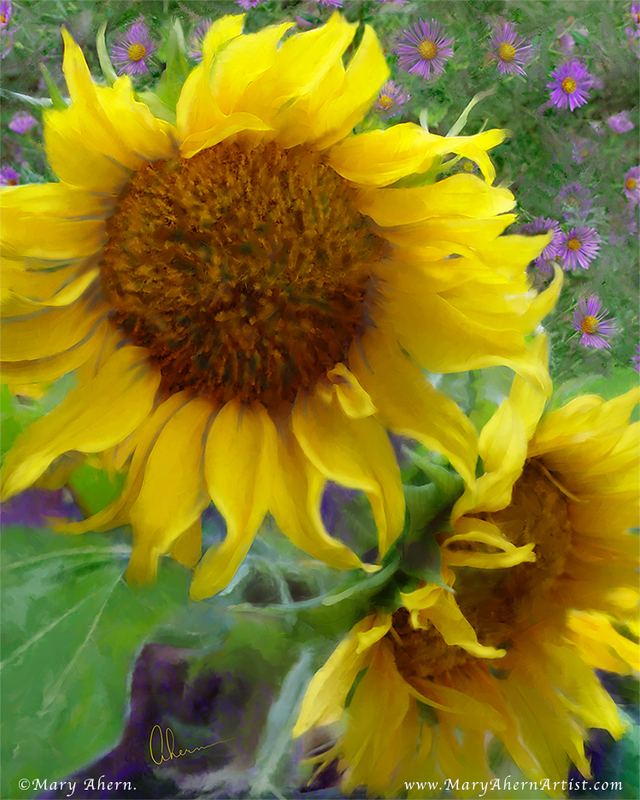 Choose from the hundreds of sizes and treatments of my Flower and Garden Art. This is the ultimate in customization for you to use when designing for your home or office. Now you can visit my Art Shop and try these features on any of the hundreds of sizes and treatment variations available to you for your home or office! Have fun! Circles in squares always give me comfort for some reason or another. This particular yellow tulip gave me comfort during the tail end of a winter when I sorely needed color flooding into my eyes. Yellow Tulip Squared © Mary Ahern. Prints available in various sizes on canvas, fine art paper, metal and acrylic in my Art Shop. So what do I find as I’m strolling past the senior buffet at Costco but this glass jar filled with joyously bulging and ready to bloom tulips. They just tossed themselves into my cart and begged to be taken home. And home they came. As the bursting buds thrust themselves open I knew they needed to continue their job of bringing color and joy to my winter and to my spring, my summer and fall. The thrill of painting flowers is that you get to immortalize them before they disappear into their own winter of lifeless existence. So many paintings came to mind as I watched the tulips unfurl. But which would be my composition. Closed or open? Silhouette or frontal? One or many? Natural sunshine or artificial light? Solid or textured background? Large or small? So I played with the tulips. Wallowing in their beauty. They seeped into my soul and brought the winter to an end for me. Being an Artist allows me to create my own reality, my own season, my own vision of how I view the normal. It brings comfort to my soul. Costco Tulips dancing in my living room in the winter sunlight. My muse, is my garden. Other gardens as well, but my garden in particular. I move in it, feel it, and hear the breezes whisper through it. I watch the lighting during the day as it slides over and around the textured surfaces. These Fire Flame Peonies bloom in my garden each year in May at the same time as the color matching azalea. Lighting so different on days with sun and with clouds. Lighting in the spring with the bright yellow greens of optimistic new growth and lighting by the fall with ambers & tans of a lived life. Morning light offers tender ambiance while afternoon colors not only light the scene from a different direction, the colors are deeper and warmer. My garden brings consciousness and meaning to me. It keeps me grounded. The ephemeral beauty of an unfertilized blossom studied up close with magnifiers and macro lenses is a representation of a miracle. The world of possibility. The beginning of a story I represent in my Art. I walk through my garden gathering ideas. Stories I want to tell. Suggested ideas I want to convey. In my garden I spend time designing the landscape or I spend time closely and intimately with a singular specimen at a particular stage of growth. 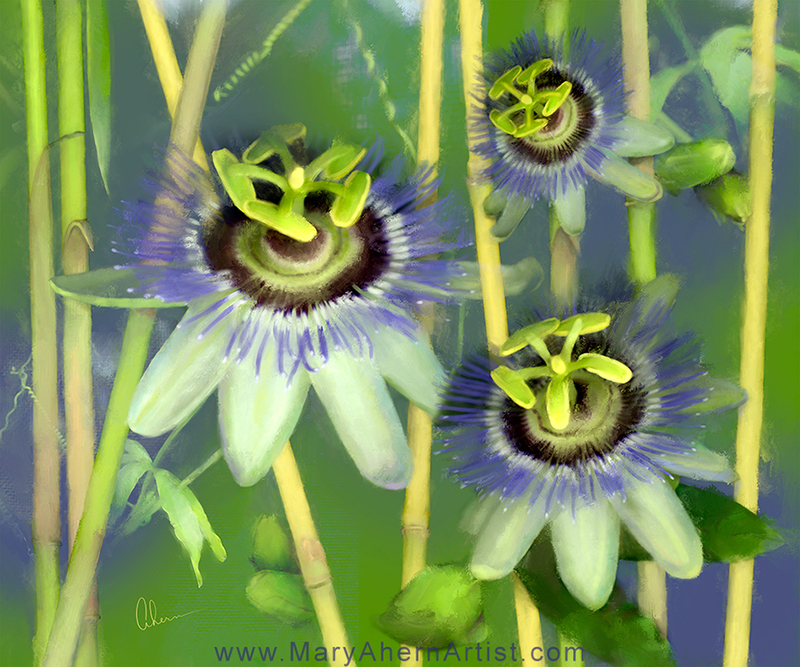 In my studio I may paint a vignette or a full landscape view of a part of the garden I’ve designed, or I may choose to paint a small portion of one flower that has moved me. The minute miracle. This is my work. Outdoors and indoors. These are the stories I tell. This is my Art. 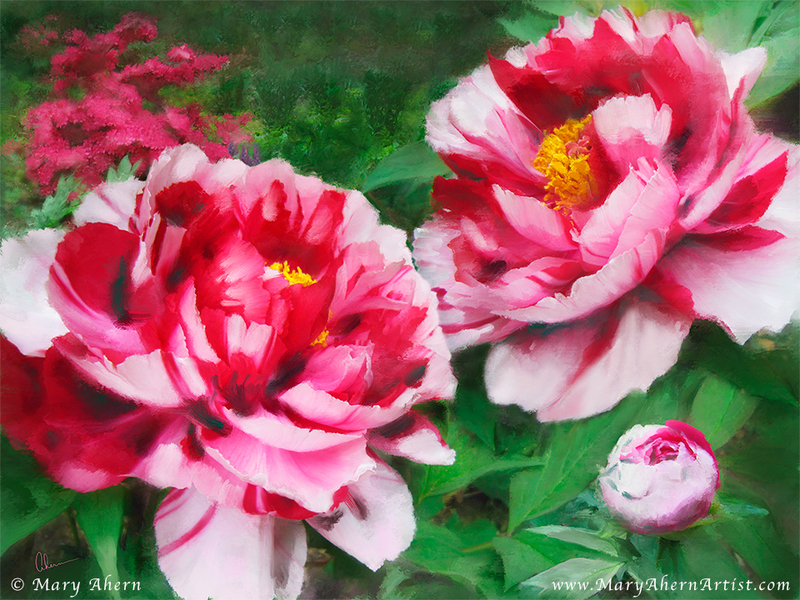 These Fire Flame Peonies bloom in my garden each year in May at the same time as the color matching azalea.This and other pieces of my Art can be purchased in various sizes on canvas, fine art paper, metal and acrylic in my online Art Shop. In my late summer garden this dramatic combination of colors occurs when the daylillies bloom amongst the rudbeckia. The cultivar name is Frans Hals daylily so how could I not fall in love with it given my Dutch heritage. The rudbeckia is the classic variety named Rudbeckia fulgida and multiplies happily in this garden setting. 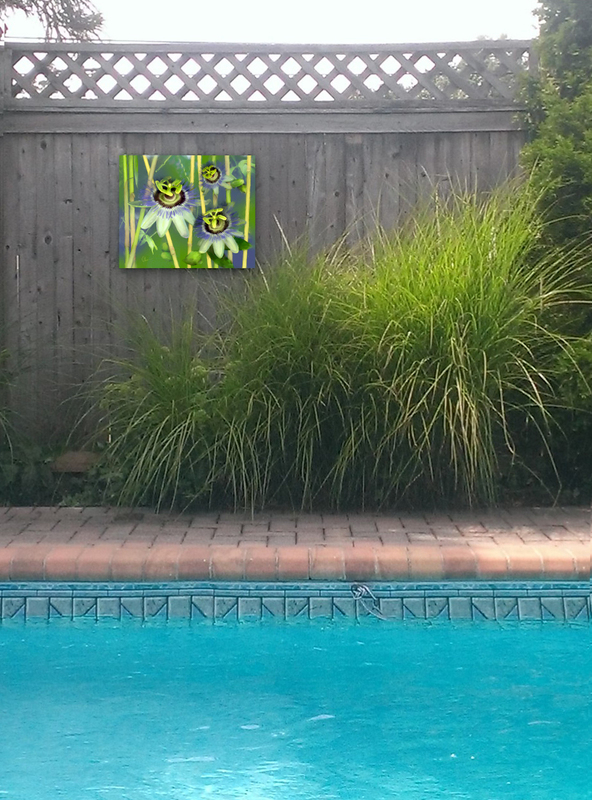 I composed this painting in a classical pyramidal style for the daylilies then using the receding rudbeckia to open the space towards the background of trees and shrubs serving as a horizontal and vertical balance. Frans Hals Daylilies with Rudbeckia 24×36″ Mixed Media on Canvas. Contact the Artist, Mary Ahern for questions regarding the availability of this painting.